We literally head West on the M4 and stop at the first Services to book some accommodation, then follow our noses towards the coast. Heading to North Devon, through Exmoor National Park to Georgeham. What a contrast from where we’ve come from. As we sit and watch the sunset over the sea it feel like a whole different world! 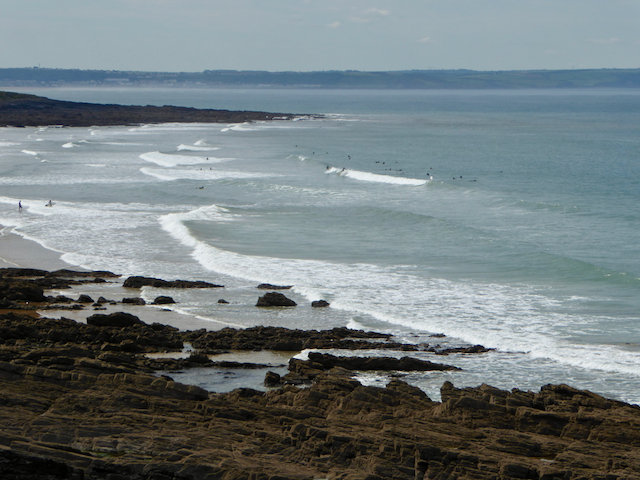 The beaches are peppered with wetsuits and surfboards and the coastal walks such a welcome surprise. Glorious views, wild and woolly Native sheep, miles of flat golden sandy beaches, mobile holiday parks and a smattering of visitor’s like us. 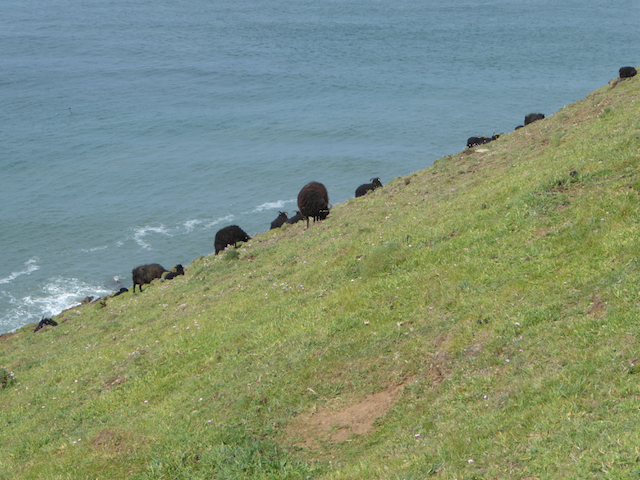 We packed a picnic and spent most of the day on the hill and even found a great coffee shop right on the coastal edge! Felt a bit like Sumner and Taylor’s Mistake. The next night at an Ilfracombe Airbnb with an elderly couple who opitimised the old fashioned BnB hosting. Because of its natural layout, the port of Ilfracombe was used as a safe haven within the Bristol Channel. A key working fishing port in North Devon, it was also a popular tourist resort being serviced by both the ferries and the the railway system. During the 1950’s Ilfracombe had its heyday with a real boom in tourism. Over peak season more than 10,000 holiday makers used the train each Saturday and even more were arriving by ferry. But sadly that didn’t last more much than ten years, as local tourism was hit by start of the cheap package holidays to foreign countries. We wandered down the hill to the port and the town. Almost dumbstruck by the sight of Damien Hirst's huge statue on the Ilfracombe pier. Known as Verity, she is a 20 metre high bronze of a bisected pregnant woman holding a sword. It’s certainly a talking point in the town, as you either love or hate it but perhaps thats the whole purpose of artwork. Next day we headed further down the coast past some wonderful spots like Barnstaple, Clovelly, Tintagel Castle, Padstow (made famous by the chef Rick Stein). The weather was pretty awful in the morning, thick fog and misty rain meant you could hardly see you hand in front of your face let alone that spectaculer Cornish coastline and couldn’t even access the track across to Tintagel Castle. We based ourselves out in the country near Redruth for next couple of days and the skies cleared so we were sightseeing with a vengeance. St Michaels Mount welcomed us, especially as we timed it almost to perfection. Tide was out so we could walk across the man made causeway easily and the gates were just opening so we were ahead of the crowds. It has a striking resemblance to Mont Saint-Michel in Normandy. Originally a major port back in the Iron Age, exporting local commodities like Cornish Tin. In the early 1100’s it was gifted to the Benedictine monks of Mont Saint-Michel and they established a small religious community building the first stone church there in 1135. Over the next 300 years it remained as a priory for Mont Saint-Michel and during this time the castle was also built. Privately owned by the St Aubyn family since 1659 they then gifted it to the National Trust in 1954 but still reside there. It really is a delightful spot with an amazing sub tropical garden and great views from the battlements. Marazion - gateway to St Michaels Mount. 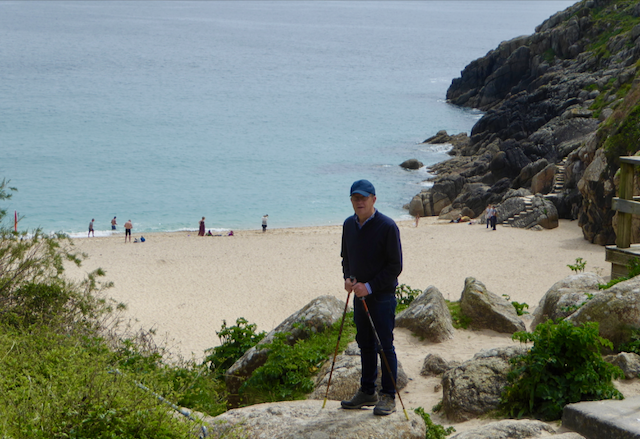 Next stop was the stunning Porthcurno with its glorious soft sandy beach and clear aquamarine seas, the Telegraph Museum and the Minack Theatre. As we wondered down to this stunning cove I had to remind myself that we were still in the UK. All the talk of stoney harsh beaches has been put to rest after what Cornwall has delivered! And yet the history and use of this stunning beach is a far cry from we we saw. The Porthcurno Telegraph station was seen as the largest in the world, with more cables coming ashore and more telegrams being transmitted and received than anywhere else in the world. Britain played a vital part in the telegraph wars during WW1. The day after war was declared they sailed a ship out into the English Channel which pulled up and cut five of Germanys undersea telegraph cables, isolating and cutting them off from vital trading centres and strategic military sources. Up and over the hill we discover the Minack Open Air Theatre dramatically situated on the cliffs with a view that almost takes your breath away. It's open from May till September and hosts a variety of plays and musicals. Sadly you have to book a long way in advance you can’t just stroll up and think you might get to see a show, like we’d hoped. But in saying that the story of the Minack theatre and how Rowena Cade’s dream of an open air theatre came to fruition is in itself worth the visit. She, almost single handedly, created this legacy with the first production being staged here in 1932. Learning to build with help from her gardeners, she spent every winter working on the theatre right up until her eighties. Not afraid of hard work they would utilise the surrounding resources even the back breaking task of bringing sand up from the beach below. 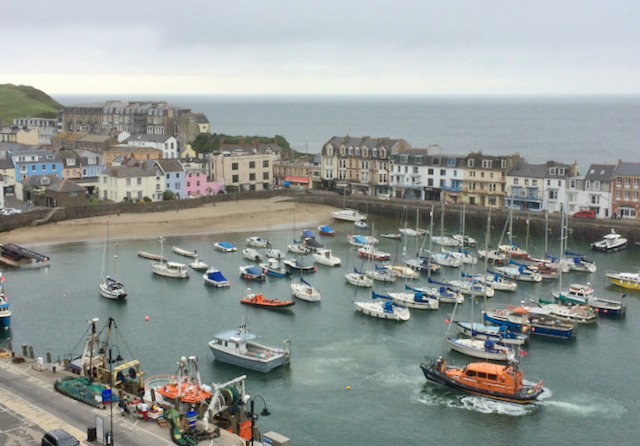 Last day we headed for the busy little fishing port of St Ives. I think the encouragement from our art loving Airbnb host was probably what took us there. But although somewhat crowded and lacking in character due to the masses of people it was well worth exploring the narrow, winding streets lined with fisherman's cottages. A wise idea to leave the car and catch the train, so we could really enjoy the magnificent views of the crystal clear blue water and long stretches of golden sandy beaches as we meandered down the coastline. Now bustling full of tourists, St Ives still attracts the artists as it has for over 200 years with its spectacular scenery and unique quality of light. Also home to a number of wonderful galleries and museums.